Order your own copy of Music of Dragons at your local retailer or online through our website today! Months have passed since the music of dragons first echoed through the warm nights of Essos. As Daenerys Targaryen has journeyed from the Dothraki Sea to Qarth, to Astapor, to Meereen, her dragons have grown, becoming more impressive, more majestic… and more dangerous. Now, Daenerys rules the city of Meereen, but her dragons can no longer be easily controlled—and the Great Houses of Westeros have taken a new interest in courting the Mother of Dragons. 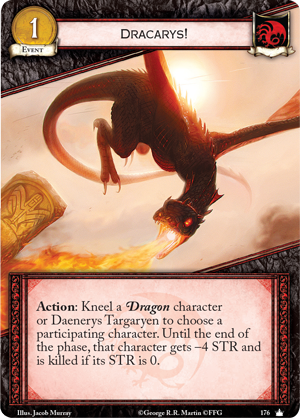 You can pledge your support to House Targaryen or another Great House with Music of Dragons, now available at your local retailer or online through our webstore! 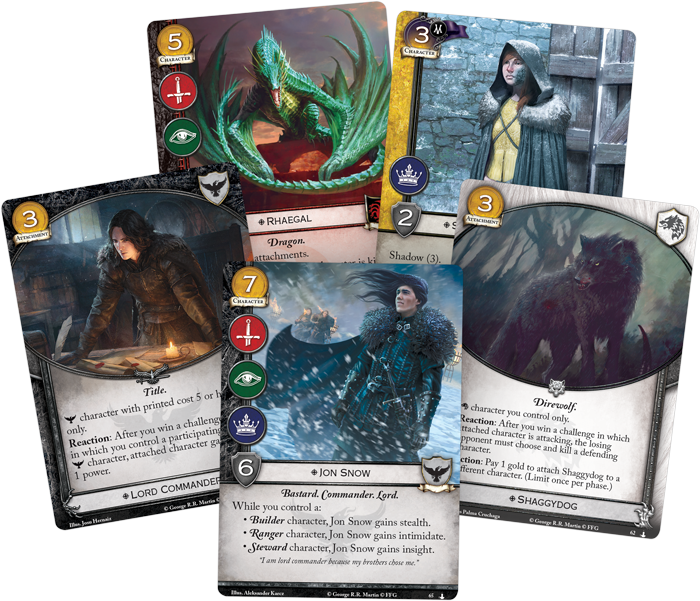 With the fourth Chapter Pack in the Dance of Shadows cycle for A Game of Thrones: The Card Game, you’ll find plenty of new shadows cards to perpetrate your conspiracies, as well as new versions of iconic characters like Rhaegal, Victarion Greyjoy, and Jon Snow. It’s time to journey to Essos and see what you can discover across the Narrow Sea! Across Westeros, many have been drawn to Meereen by the tales of Daenerys Targaryen. Characters as diverse as Tyrion Lannister, Ser Jorah Mormont, Victarion Greyjoy, and Quentyn Martell all converge on the city. Some would swear themselves to Daenerys’s service, others seek to win her hand in marriage—but all will find more than they bargained for in the sprawling cities of Slaver’s Bay. Of course, what are people traveling across the known world to see, if not one of the first dragons in decades? Rhaegal (Music of Dragons, 73) makes his debut as a fully-grown Dragon in Music of Dragons. 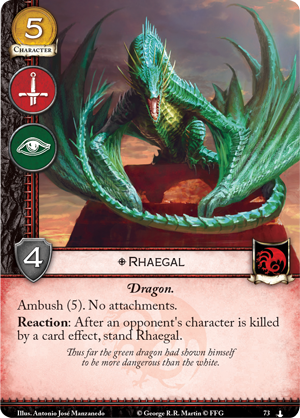 It’s immediately apparent that Rhaegal has grown in size and strength, but he can also arrive in the midst of challenges with the ambush (5) keyword. 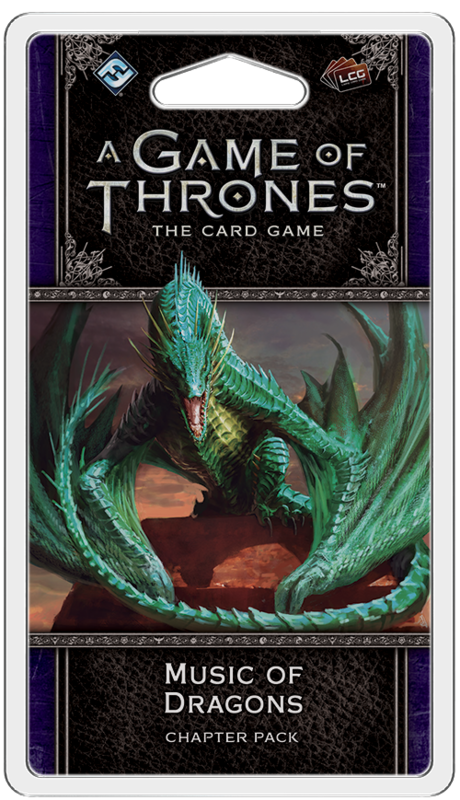 What’s more, Rhaegal is not limited to appearing in only one challenge—whenever an opponent’s character is killed by a card effect, you can stand Rhaegal, making him the perfect accompaniment to Daenerys Targaryen (The Faith Militant, 93) or Dracarys! (Core Set, 176). 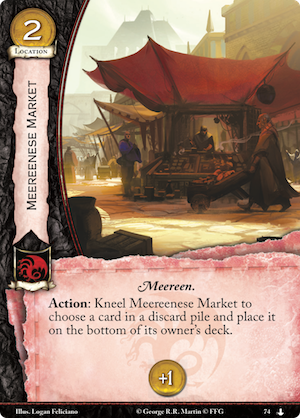 House Targaryen also unlocks their non-limited economy location from this cycle: Meereenese Market (Music of Dragons, 74). In addition to providing a static gold bonus, you can kneel this location to choose a card in a discard pile and place at the bottom of its owner’s deck! While this may seem like a small benefit, it has some surprising applications. 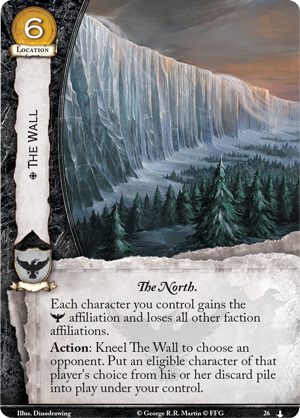 You might recycle your burn events if you have a way to shuffle your deck, or you can protect your most important characters from The Wall (The March on Winterfell, 26). 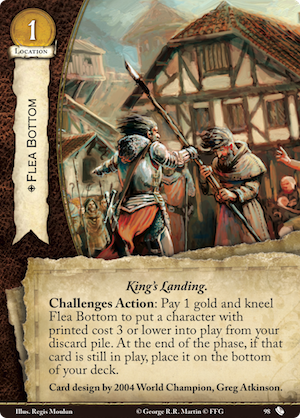 Or, you could remove characters from your opponent’s discard pile so they can’t be recurred with Flea Bottom (Oberyn’s Revenge, 98). No matter how you use it, simply gaining access to non-limited economy can be potent for the Targaryens. 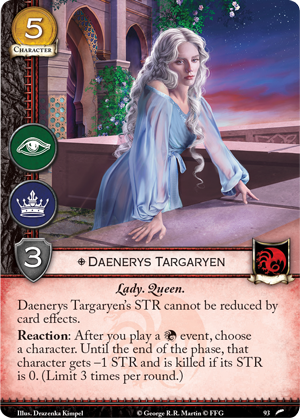 The secret alliance between House Martell and House Targaryen has led Quentyn Martell to journey to Essos, and the Martells also gains new cards in Music of Dragons. 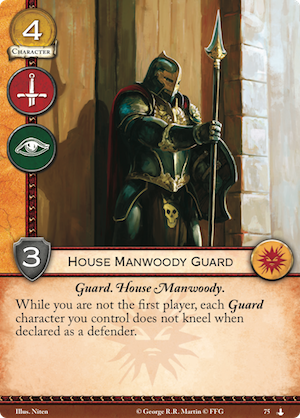 House Manwoody Guard (Music of Dragons, 75) offers a boost to any player who prefers to bide their time and strike when the moment is right. This character’s effect is simple—so long as you aren’t the first player, your Guard characters won’t kneel to defend against a challenge. 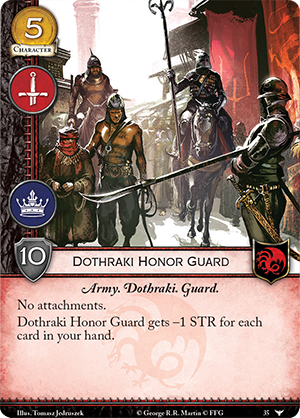 Of course, this affects the House Manwoody Guard itself, but if you ally with House Targaryen it also increases the effectiveness of characters like Dothraki Honor Guard (Watchers on the Wall, 35). 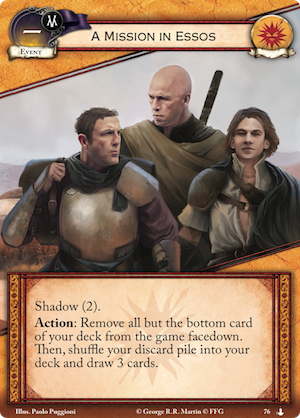 Still, perhaps the most dangerous card in Music of Dragons is the new Martell event, A Mission in Essos (Music of Dragons, 76). With a truly unique effect, this event can be played to remove almost your entire deck from the game. Then, you’ll shuffle your discard pile into your deck and draw three cards immediately! If you play A Mission in Essos at the wrong time, your game will be over before it truly begins, but if you manage to build and seed your discard pile correctly, the possibilities are endless. With a much smaller deck and guaranteed knowledge of the cards you can reasonably expect to see, A Mission in Essos just might be the trick you need to pull off an unexpected, undeniably flashy win. The shadows are deepening as the players of the game of thrones converge on Meereen. Will you stand among them to stake your own claim to the Iron Throne? Pick up your own copy of Music of Dragons (GT34) at your local retailer or online through our webstore today!